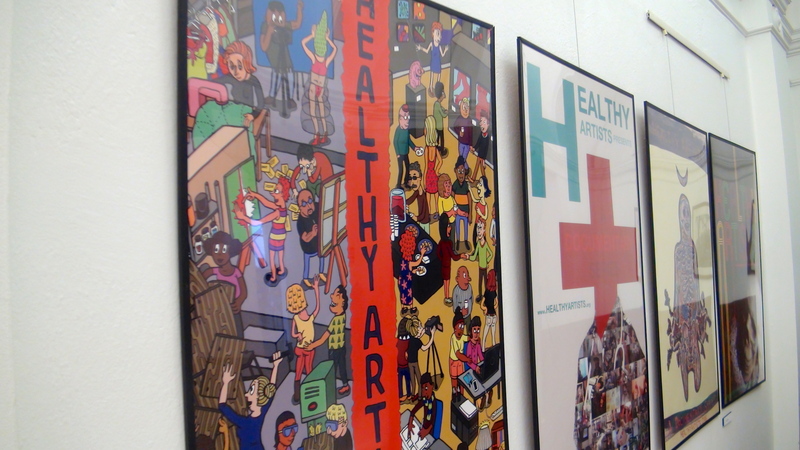 Stop by the Carnegie Library (Main) in Pittsburgh, PA to see the Healthy Artists Movie Poster Exhibition! Our 21 posters will be up in the library’s gallery space until June 30th. We asked some of Pittsburgh’s finest artists to create posters inspired by our documentary series, their own experiences, and the need for continued health care reform in the US. Drop by and see which poster speaks to you! Also, fill out a notecard and answer the question: “What would you do if the US health care system worked for you?” Drop it in the fishbowl, and you’ll be entered into a drawing to win a limited edition poster print. Big thanks to Jude Vachon (artist, librarian, and health advocate extraordinaire) for making this dreamy library show a reality! Vote for a Healthy Democracy!